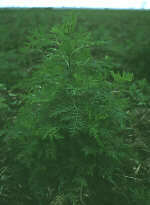 Sweet wormwood contains a substance that helps against malaria. Sweet wormwood, Artemisia annua, grows mainly in South East Asia and is related to common mugwort and absinth. Linnaeus cultivated sweet wormwood in Linnaeus’ Garden in Uppsala but it was probably not because he was aware of its medicinal properties. In China at the end of the 1960s they began extracting malaria-active substances from plants. One of the plants studied was sweet wormwood, which had been recommended in China for fevers as early as 340 BC. They extracted a substance which was named artemisinin after the scientific name Artemisia. Today, Artemisinin is widely used in certain countries in South East Asia, since the malaria parasite has developed resistance to many of the other anti-malaria products. A normal period of treatment lasts for 5 to 7 days. So far, artemisinin is effective against most of the malaria parasites, but if it is used too frequently, the parasites may become resistant. Resistance may develop when the parasite gets used to otherwise lethal substances in low concentrations. The advantage with artemisinin is, among other things, that the amount of parasites in the blood is reduced by half within just a few hours, thus making it difficult for the parasite to develop resistance. On the other hand, quinine has a half-life of 2-3 weeks.